The old lunchroom (1950s) is all that remains of the Excelsior School and serves today as the Snipesville Community Center. Jesse Bookhardt writes: This photo is of the old Excelsior School grounds at Snipesville, Georgia. Excelsior was where all the Bookhardt children attended during the 1940’s through the 1960’s. 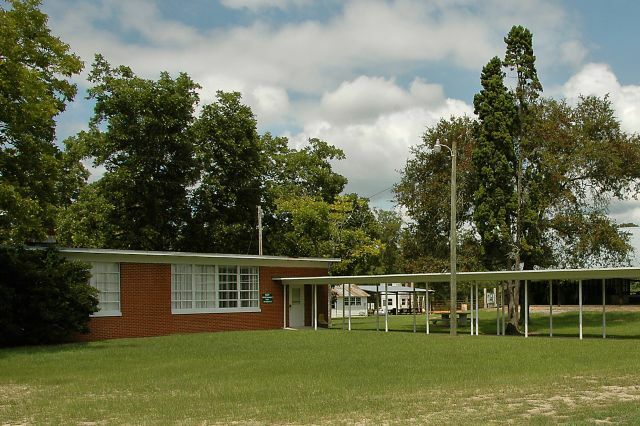 The rectangular brick building with the covered walk was the school’s last lunchroom built in the 1950’s. Prior to that the white wooden structure that is in the background was the cafeteria. Where the tin covered pavilion stands was the main school building’s location. Sometime after Jeff Davis County consolidated schools, the Excelsior building fell on hard times. Regrettably, the main building burned under rather mysterious circumstances. At the time the school was being used as a “night club” of sorts that dispensed alcoholic spirits. Disapproving, many that had attended the school felt the use of the school in such a way was a disgrace. It was like having a church used as a bar or bothel. The burning flames took away the building but could not erase the memories, friendships, and learning that many still cherish. School colors were Black and Red and the Yearbook was called the Huckle Buck. A farm net wire fence enclosed the grounds and at the entrance one had to cross a stock-gap. Two old multi holed out houses stood in the rear of the main brick building, one on each side. Students played basketball on a red clay court and softball in a rough field that abutted the Snipesville to Jacksonville, Georgia Road (Ga.107). The school had a basketball team and competed against other county teams—Altamaha, Brooker-Denton, Satilla, and Hazlehurst. The team also participated in an annual basketball tournament in Broxton, Georgia. Long live the memory of Excelsior School. 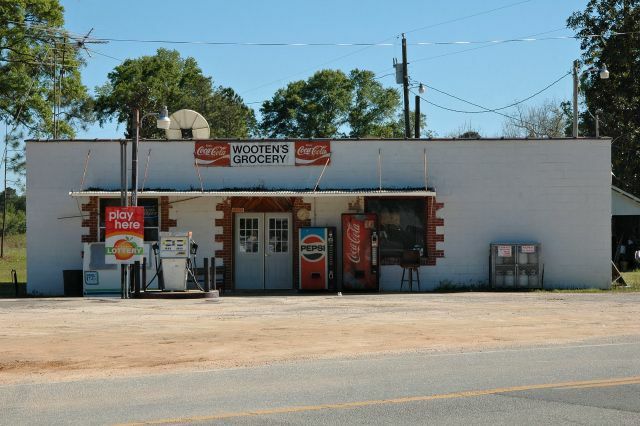 Jesse Bookhardt shared this history of Wooten’s: When I was a kid growing up in the Snipesville community, Wooten’s Grocery was A. I. Sinclair Grocery. It was the center of the farming and timber endeavors of mid-twentieth century Southwest Jeff Davis County citizens. The store is located near the original site of the Snipes family wooden store which stood during the 1930’s and early 1940’s. Snipesville was named for this family. At one time the crossroad hamlet had a couple of stores. Robert and Rosalie McCall ran a store located directly across from the main entrance of Excelsior School. It burned in the late 1950’s and was never replaced. At sometime in the 1960’s, Mr. Clarence and Mrs. Ruby Smith operated a store at the intersection of the Snipesville-Denton Road and Georgia Highway 107— just opposite Excelsior Methodist Church . The Sinclair/Wooten store has stood a long time and has served the needs of locals. We often drove to the “The Store,” and would go in for a candy bar, and if we had enough money, a cool “Co-Cola” from the drink box. Sometimes we chose to mix a pack of Tom’s salty peanuts with our Co-Cola. Once Mr. Arlie had a monkey as a mascot or pet at the store. The primate was know to bite if you got to frisky with him. At another time, a baby deer was kept in a pen behind the store. Someone working turpentine boxes found the fawn in the swamp and brought it to the Store. Everybody in the community got to see it grow. One of the first televisions in the community was available at the store for viewing. It was common on certain nights to have men gather around the black and white snowy images to watch their favorite program. The thing often faded out right during the good part of the show. I remember too that we purchased gasoline and kerosene at Sinclair’s Grocery. We served ourselves and then went in to pay. The kerosene tank sat to the right of the main door of the store. One had to hang your can from the spout and hand pump the fuel. Groceries of common brands were available, and fresh meats were cut and sold. Groceries were packed in used cardboard boxes instead of plastic or paper bags. No beer or any kind of alcoholic drink was served, but I am sure that exchange of some spirits took place between patrons in the parking area. Mr. Arlie allowed credit to his regular customers and was reasonable in collecting. If a family was having a hard time, often additional time was given to pay. The store and parking area also served as a meeting place where people met to conduct business deals, or to just visit. Supplies for fishing were also sold. The Atlanta Journal and Constitution paper was sold at the store. The parking area in front of the establishment was notoriously pitted with holes and when it rained a muddy mess was a reality. Generally, the store was a man’s domain. Women certainly were welcome but it was not customary for them to go there that often. During mid-century it was common to see tractors, trucks, and cars parked at the store. Home made cypress fishing boats, plows, and other items were seen in the backs of parked trucks. As times change, it is good to see that some of the old has survived and has been captured by the photosphere to be shared across the Internet.